It was designed by Andrew Brown whose great grandfather, Rev Thomas Notman, was the minister there between 1936-43. Rev Eleanor McMahon and sculptor Andrew Brown by the statue of Mary Barbour in Govan, Glasgow. In those days the building in the heart of Govan, famous for shipbuilding, was called St Mary's Parish Church. Mr Brown won a competition decided by public vote to design the monument to Mrs Barbour, who was a key player in fighting rent increases imposed by Glasgow landlords during WW1. 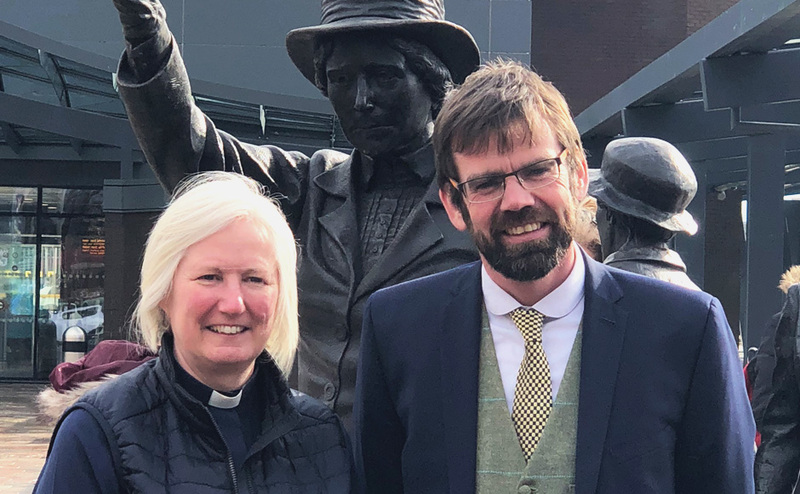 The sculptor, who grew up in Dumfries, met Rev Eleanor McMahon, interim minister at the church, and the pair were photographed beside the statue, which is outside the subway station. It captures a day in November, 1915 when Mrs Barbour led a 20,000 strong protest through the streets of Glasgow. Mrs Barbour was a central figure in the Glasgow strikes of 1915 against rent increases and she formed eviction resistance groups of mainly women which were dubbed as 'Mrs Barbour's Army'. The Govan-based campaigner led months of protest, which culminated in a large demonstration outside Glasgow Sheriff Court and the city chambers. 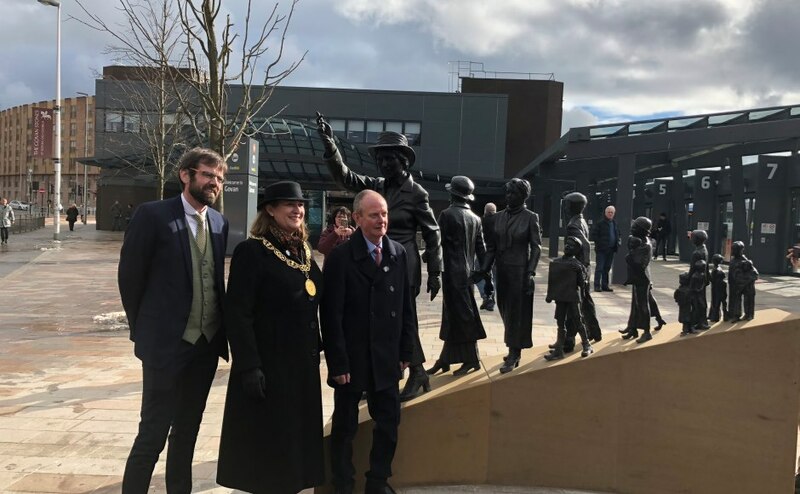 The statue was unveiled on International Women's Day - a ceremony attended by thousands of people, according to local councillor, Bailie John Kane. Miss McMahon said: “It was an honour to meet Andrew Brown, particularly given his family links to our church. “We are excited that we have a statue of Mary Barbour as our neighbour and we had our own celebration in the church hall this morning. “We are pleased to be associated with her because she is a great role model for people and the sculpture has put Govan on the map." The minister said the political activist, who was born in 1875 in Kilbarchan, Renfrewshire and became one of Glasgow's first woman councillors, was an inspirational figure. “Mary Barbour was a woman of great strength, determination and resilience who was committed to fighting the causes of working people," she added. The statue was commissioned after a long-running fundraising campaign by the Remember Mary Barbour Association. The district of Govan is currently undergoing huge investment and regeneration and the church's Govan Cross building is in the midst of a £1.2 million repair and refurbishment programme. L-R - Andrew Brown, Councillor John Kane and Lord Provost Eva Bolander. Miss McMahon said: "The congregation have worked in the face of adversity to raise the necessary funds to ensure that the work is done. "Yet through this, the congregation are finding new ways to be the church. "Both the refurbishment of the Govan Cross building and the installation of the Mary Barbour statue will encourage further investment and interest in Govan. "The community has long had its roots within the working classes, and the congregation are proud of their industrial heritage. "Govan is now a diverse and increasingly eclectic community and the promotion of Mary Barbour, and the links of the sculptor Andrew Brown to the Govan Cross building, further cement the congregation’s work to be a church of the community, for the community. "We welcome people of all backgrounds, and increasingly different nationalities into the church, and we are strong, honest and a hardworking congregation- much the same as Mary Barbour herself." Rev John Brown, the father of former Prime Minister Gordon Brown, was an assistant to Mr Notman in 1936. He superseded him as minister at the Govan Cross building.